My collection is back, and so am I! 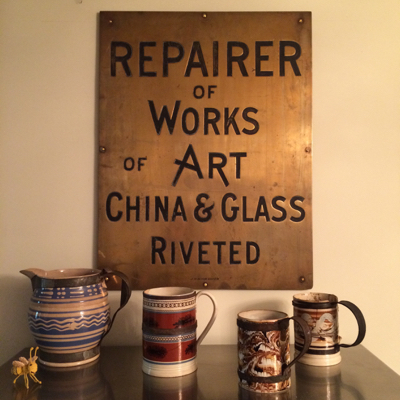 After a brief break from posting, I am back with more to share from my collection of antiques with inventive repairs. Last weekend, the nearly 300 pieces from my collection, on loan to Boscobel for the exhibit Make-Do’s: Curiously Repaired Antiques, were returned to me. I was without them for almost a year and during that time, the suddenly empty shelves in my office slowly filled up with books and other household items. Due to time restraints, rather than methodically return the hundreds of teapots, jugs, plates, cups, goblets, etc. to my shelves in an orderly fashion, I was just able to pile them up all around the house, praying that my 2 young cats, Grady and Oscar, wouldn’t turn my prized repaired pieces back into broken antiques. As I have said before, there’s nothing more redundant than a broken make-do. So far, I am happy to report that everything is still intact! Looking ahead, I may not be posting every week as I have for the past nearly 7 years, so please be patient with me between lapses in my posts. I have some exciting new projects I am working on and will share the results in the near future. Thank you for following my blog, which continues to bring me great pleasure, as I acquire and research new pieces and write these posts.